September | 2011 | E-verything! This Fine Focus session was presented by one of our regular participants Sandra Stewart (@marndon) from New South Wales. 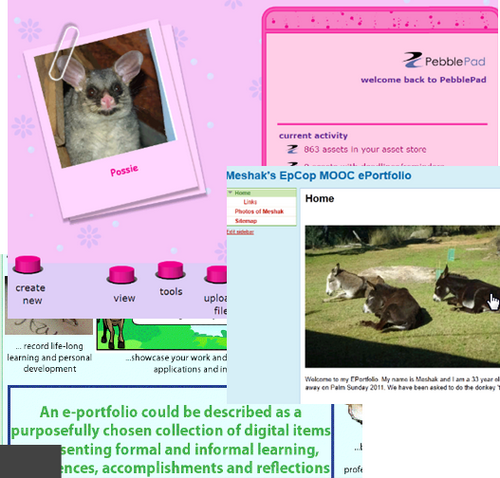 Sandra introduced us to e-portfolios with fantastic illustrations from her own experience. The session was recorded as always and is well worth watching! Sandra was a great facilitator keeping us busy & therefore engaged throughout! Initially she found out about our awareness/understanding of e-portfolios and then moved on to show a variety of examples using different platforms through Application Share (this is somewhat problematic to use in BbC as opposed to Elluminate). Sandra encouraged us to think about the purposes of e-portfolios and gave us an activity to help us think about the potential for us personally! So agree with Sandra that to use anything with students we need to have a degree of familiarity with the “tool/app” ourselves! I particularly enjoyed that the examples were not all using Mahara. Not that I have anything against it but it seems often to be the only option mentioned in Aus VocEd! This was a GREAT session – so love it when our regular participants run a session as this is a very large part of what we are about! Sandra has encouraged and motivated me to make more effort with e-portfolios. My institute has just got Edublogs Campus & we plan to enable students to use blogs as an e-portfolio. Part of the reasoning behing this is that I already know Edublogs blogging platform well – this will enable me to help my colleagues more than if we moved immediately to a specified e-portfolio platform. Edublogs Serendipity webinar overview – fun, individualised, interesting & easier learning? 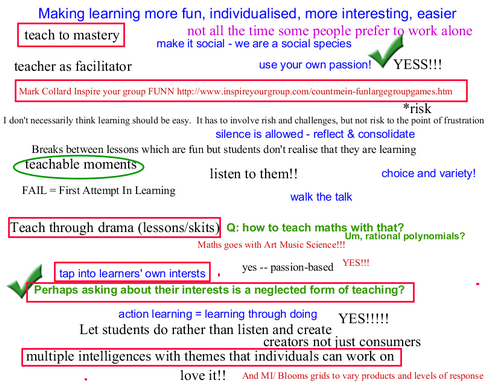 In this session we took a look at making learning: fun, individualised, more interesting and easier! A very tall order – but it seemed to us when we looked at these suggested topics that they were closely inter-connected so a unanimous decision was taken to consider them all at once! As always the session was recorded and is well worth catching. We were a small group – all of whom have participated in many of these webinars. There were many whiteboard and chat contributions with everyone also taking part in the audio discussion. Just for once we didn’t have a proper poll! Because the topics were so closely related we chose to encompass them all within our discussion. Also unusually there was not a heavy focus on the “e-” components we might include, although I think we were all aware that that “e-” components are great tools for making learning more fun, individual, interesting and even easier! As we often do we began with a whiteboard having the chosen topic as the heading and simply added our own ideas about the topic. This was a mixture of strategies, ideas and practices. Each of us then chose ONE of our contributions to the whiteboard and expanded on it through audio (these are the ones enclosed by red rectangles on the image). This is something I really love when it is feasible – really only possible for everyone to do this when we are a small group and when we all have microphones. Each of these gave rise to questions and further discussion. In the remaining time we looked a little more at “making learning easier” with some debate about whether it should be always easy and indeed if it is possible for it to always be so. The consensus seemed to be that there are some things that require a degree of repetition and or practise to learn them to a degree where they are useful. My own particular take on this is a feeling that by always making it “easy and fun” we may be setting students up to fail later in life in workplaces and in life. There are dull, boring, routine tasks that we all need to do in life and in our workplaces, there are also many things which are not easy. If we lack stamina and the ability to be persistent to some degree then we risk not achieving our goals. This session was fun – this group of “old hands” are all great contributors giving rise to a great feeling of collaboration throughout the session. I so much enjoy Serendipity because we never know where we will go! 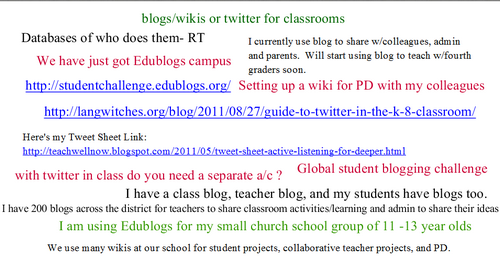 Edublogs webinar overview – Social Media With Students? 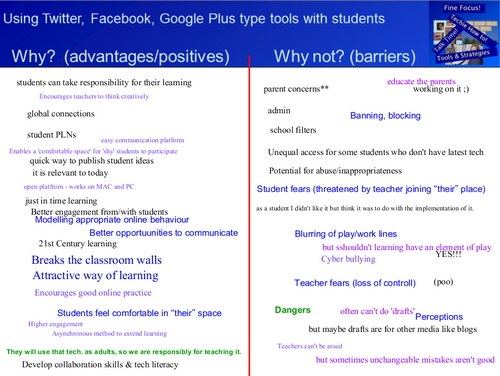 This Fine Focus session was really a spin-off from last week’s Serendipity session where we touched on using Twitter with students but didn’t really have time to explore the issues. This was a great session with lots of whiteboard activity and as usual the session was recorded. Although the session title refers to “social media” this is such a massive topic that I focussed on social networking with students and chose what are probably the two most well known and widely different from one another social networks – Twitter and Facebook. I then added in GooglePlus because although this is very new I suspect it will ultimately be extensively used with students because of the way circles can be used. We started with some polling to find out where everyone was “coming from” on using social networks with students. Next we set the scene with a brief look at some recent items on social netwroks with students including two short videos. This led on the the quesion of whether we should use this type of tool with students – the poll result was a resounding “Yes” and we quickly filled a whiteboard with the positives and negatives. The next considerations were the contexts and circumstances in which we might use social networking with our students. This was followed by sharing how (if we currently do) we use one or more of these with students. We finished with a poll on whether we now felt it was more likely that we would use these with students. There is also a slide with live links for the videos and some other items of interest for social networking with students. This session worked well – it followed a similar pattern to most of the other discussion type topics that I facilitate in Fine Focus sessions. As is often the case I felt that I talked too much, however everyone seemed to enjoy the session. The use of video was something I don’t do often – although I have recently been showing colleagues how to incorporate it via the multimedia window. It worked fairly well although the videos did not play for one participant despite being mp4 and so likely to be playable by the majority of people. This is one of the reasons that I tend to avoid video the other is bandwidth and download time issues. Even though both videos were small files they still took considerable time to download to participants after they joined the room, so it isn’t a good idea to play videos very early in the session. However I will be trying to include more video because I feel it is something I need to become more familiar with. The chosen topic for this session was a look at blogs, wikis and Twitter for classrooms, this was a clear leader in the voting. This session was very interactive with lots of audio discussion as well as text chat and whiteborad contributions. As always the session was recorded although I was a couple of minutes late starting the recording and so went back to the start and reintroduced the topic. This happened in part because when loading slides I had accidentally clicked record for a few seconds – in the new interface the record button is right next to load content and is not red! As a result of this the excellent “Recording Reminder Window” closed. and this led on to a very productive audio and text disscussion around the points on the whiteboard with people talking about how they use the tools in their classes and sharing ideas and links. With only a short time left we moved on to look briefly at privacy issues and particularly the need with younger students to maintain confidentiality for their safety. This was linked with the need to establish good digital footprint habits. We also talked briefly about Twitter with thoughts about social media for rural students and also backchannelling and its various facets – a subject that perhaps deserves a whole session for discussion! This was a great session with many thought provoking ideas. Something I really love about Serendipity sessions is that no matter how many times a similar topic is raised the particular participant mix in any one session drives the conversation in different directions so that there is always something new to learn and new aspects of the topic to consider.